For the community in England, see Bay Horse. Bay is a hair coat color of horses, characterized by a brown body color with a black mane, tail, ear edges, and lower legs. Bay is one of the most common coat colors in many horse breeds. The black areas of a bay horse's hair coat are called "black points", and without them, a horse cannot be considered a bay horse. Black points may sometimes be covered by white markings; however such markings do not alter a horse's classification as "bay". Bay horses have dark skin, except under white markings - where the skin is pink. Genetically, bay occurs when a horse carries both the Agouti gene and a black base coat. The addition of other genes creates many additional coat colors. While the basic concepts behind bay coloring are fairly simple, the genes themselves and the mechanisms that cause shade variations within the bay family are quite complex and, at times, disputed. The genetics of dark shades of bay are still under study. A DNA test said to detect the seal brown (At) allele was developed, but subsequently pulled from the market. Sooty genetics also appear to darken some horses' bay coats, and that genetic mechanism is yet to be fully understood. Bay horses range in color from a light copper red, to a rich red blood bay (the best-known variety of bay horse) to a very dark red or brown called dark bay, mahogany bay, black-bay, or brown (occasionally "seal brown"). The dark, brown shades of bay are referred to in other languages by words meaning "black-and-tan." Dark bays/browns may be so dark as to have nearly black coats, with brownish-red hairs visible only under the eyes, around the muzzle, behind the elbow, and in front of the stifle. Dark bay should not be confused with "Liver" chestnut, which is also a very dark brown color, but a liver chestnut has a brown mane, tail and legs, and no black points. The pigment in a bay horse's coat, regardless of shade, is rich and fully saturated. This makes bays particularly lustrous in the sun if properly cared for. Some bay horses exhibit dappling, which is caused by textured, concentric rings within the coat. Dapples on a bay horse suggest good condition and care, though many well-cared for horses never dapple. The tendency to dapple may also be, to some extent, genetic. There are many terms that are used to describe particular shades and qualities of a bay coat. Some shade variations can be related to nutrition and grooming, but most appear to be caused by inherited factors not yet fully understood. The palest shades, which lack specific English terminology found in other languages, are called wild bays. 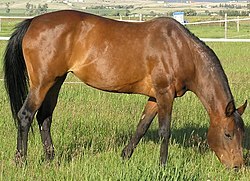 Wild bays are true bays with fully pigmented reddish coat color and black manes and tails, but the black points only extend up to the pastern or fetlock. Wild bay is often found in conjunction with a trait called "pangare" that produces pale color on the underbelly and soft areas, such as near the stifle and around the muzzle. Bay horses have black skin and dark eyes, except for the skin under markings, which is pink. Skin color can help an observer distinguish between a bay horse with white markings and a horse which resembles bay but is not. Some breed registries (including the Jockey Club Thoroughbred registry) use the term "brown" to describe dark bays. However, "liver" chestnuts, horses with a red or brown mane and tail as well as a dark brownish body coat, are also sometimes called "brown" in some colloquial contexts. Therefore, "brown" can be an ambiguous term for describing horse coat color. It is clearer to refer to dark-colored horses as dark bays or liver chestnuts. However, to further complicate matters, the genetics that lead to darker coat colors are also under study, and there exists more than one genetic mechanism that darkens the coat color. One is a theorized sooty gene which produces dark shading on any coat color. The other is a specific allele of Agouti linked to a certain type of dark bay, called seal brown. The seal brown horse has dark brown body and lighter areas around the eyes, the muzzle, and flanks. A DNA test said to detect the seal brown (At) allele was developed, but the test was never subjected to peer review and due to unreliable results was subsequently pulled from the market. Some foals are born bay, but carry the dominant gene for graying, and thus will turn gray as they mature until eventually their hair coat is completely white. Foals that are going to become gray must have one parent that is gray. Some foals may be born with a few white hairs already visible around the eyes, muzzle, and other fine-haired, thin-skinned areas, but others may not show signs of graying until they are several months old. A liver chestnut is distinguished from a bay by a lack of black points. The mane and tail are the same color as the body, or lighter. For description of other coat colors, see Equine coat color. Chestnuts, sometimes called "Sorrels," have a reddish body coat similar to a bay, but no black points. Their legs and ear edges are the same color as the rest of their body (unless they have white markings) and their manes and tails are the same shade as their body color or even a few shades lighter. Black is occasionally confused with dark bays and liver chestnuts because some black horses "sunburn," that is, when kept out in the sun, they develop a bleached-out coat that looks brownish, particularly in the fine-haired areas around the flanks. However, a true black can be recognized by looking at the fine hairs around the muzzle and eyes. These hairs are always black on a black horse, but are reddish, brownish, or even a light gold on a bay or chestnut. Buckskin horses have a black mane and tail, but instead of a red or brown coat, they have a cream or gold coat. Though once called a "Sandy" bay in older texts on horse color, the genetic distinction created by the cream gene is significant. They are a bay horse that is also heterozygous for the dominant creme (CCr) allele. The black pigment remains largely unchanged, but any red pigment in the coat is diluted to gold. Buckskins are seldom mistaken for bays because their coats are significantly lighter and have no hint of a red or orange tint. Perlinos are bay horses who are homozygous for the dominant creme (CCr) allele. Both black and red pigment are diluted to some shade of creme, though the formerly black points often have a stronger reddish cast. The skin is a slightly pigmented pink and the eyes are blue. Bay duns are bay horses with at least one dominant dun allele. Red and black pigment at the extremities remains largely unchanged, but on the body, black pigment is diluted to slate and red pigment is diluted to a dustier shade. The effect is similar to buckskin, but the coat of a bay dun is a flatter tan rather than bronze, and all duns have some form of primitive markings that include a dorsal stripe along the backbone, and sometimes faint horizontal striping at the back of the front legs. Amber champagne refers to a bay horse with at least one dominant champagne allele. Black pigment is diluted to warm brown and red pigment to gold. The effect is similar to buckskin, but the points of an amber champagne do not remain black, and the skin is mottled. Amber champagnes also have hazel eyes rather than brown. Silver bays are bay horse with at least one dominant silver (Z) allele. Red pigment is unaffected, but black pigment in the short coat is diluted to dark, flat, brown-gray while the longer hairs are diluted to silver. The overall effect on a bay is that of a chocolate-colored horse with a pale mane and tail. Bay Roan horses are bays with at least one dominant roan (Rn) allele. The roan gene creates an effect of white hairs intermingled with the red body coat. This color was formerly lumped together with chestnut or "strawberry" roans and called "red roan." Bay pintos are bay horses with any number of white spotting genes, including but not limited to tobiano, frame overo or splashed white, and so on. The pattern has no bearing on whether or not the horse is bay. Pinto horses also may have a bay base coat overlaid by white spots. Sometimes the term "skewbald" or "tricolor" is used, especially in the UK, to refer to bay pintos. Sabino is a color pattern in the pinto family, but in some cases, the gene may be minimally expressed in the form of very bold white markings or slight body spotting and such horses will be registered by their owners as "bay," particularly in breed registries that do not have a category for pinto. Bay Leopards are horses that carry the leopard (Lp) gene or gene complex characteristic of the Appaloosa and other breeds. This gene also produces secondary characteristics that include mottled skin, a white sclera around the eye, and striped hooves. A few bay horses may carry the rabicano gene, which either produces faint roaning on only some parts of the body or can cause some white or cream hairs to appear in the mane or tail, sometimes creating a "skunk" effect. Most bays with rabicano are registered as either bays or as bay roans. The various shades of bay may be genetically produced by multiple factors, but a simple explanation of bay genetics is that "red" color, seen in the chestnut horse, represented by the recessive "e" allele; and black color, represented by the dominant "E" allele, are the two most basic coat color genes. All other colors are produced by the action of additional alleles acting on these two base colors. A bay horse carries both the Extension (E) allele and a suppression gene known as the agouti gene (A).The agouti gene, dominant over the black gene, limits or suppresses the black coloring to black points, allowing the underlying red coat color to come through. Unlike other types of "point" coloring, such as that seen in Siamese cats, the black points characteristic of bay coloring are not produced by a dilution or albinism gene. Because the extension (E) gene and agouti (A) gene can be either heterozygous or homozygous, the extent to which a bay passes on its color varies widely from one horse to another depending on its genotype and that of its mate. Also, a chestnut may carry the Agouti gene, which will be "masked" or not manifest until the horse is bred to a horse with the E allele and produces offspring with both genes. The faint countershading dorsal stripe seen on some bays. This is not the same as the primitive markings of a dun horse. The bay family of coat colors is dependent on two autosomal simple dominant genes: Extension and Agouti. The role of the Extension gene is to produce a protein called Melanocortin 1 receptor or Mc1r. Mc1r allows the black pigment eumelanin to form in hair. Closely tied to this process, the role of the Agouti gene is to produce Agouti signalling peptide Asip, which disables Mc1r, effectively allowing the red pigment phaeomelanin to "show through." However, this disabling does not occur throughout the coat; it occurs only in pulses on the body coat and not at all on the extremities or points. If a horse does not possess a functional, dominant copy of the wildtype E-allele at the Extension locus, then Mc1r cannot be produced. Without this protein, the black pigment eumelanin cannot form in the hair. Such horses, having two copies of the recessive mutation, have eumelanin-free, phaeomelanin-rich coats; they are red, or chestnut. In summary, unless a horse has at least one functional E-allele, it cannot be bay. Similarly, if a horse does not possess a functional, dominant copy of the A-allele at the Agouti locus, then Asip cannot be produced. Without Asip, eumelanin is unregulated and the coat is wholly black. The regulation of black pigment, though, is dependent on its presence in the first place; a horse with the recessive Agouti genotype aa is indistinguishable from any other genotype in a horse with a eumelanin-free coat. When eumelanin is present, it is restricted in varying degrees by the action of Asip. The action of Asip can be observed in horses which have their winter coats clipped. When shaved close, the black tip is shorn off leaving the phaeomelanic bottom of the shaft. This produces a dull, orange-gold appearance on the body coat which is lost with the spring shed. This is not usually seen in dark bays, which have little red in the hair shaft. A+, dominant, is responsible for the wildtype wild bay coat. This was accepted until the 1990s, when a new theory became popular. The new theory suggested that shades of bay were caused by many different genes, some which lightened the coat, some which darkened it. This theory also suggested that seal brown horses were black horses with a trait called pangare. Pangaré is an ancestral trait also called "mealy", which outlines the soft or communicative parts of the horse in buff tan. The combination of black and pangaré was dismissed as the cause of brown in 2001, when a French research team published Mutations in the agouti (ASIP), the extension (MC1R), and the brown (TYRP1) loci and their association to coat color phenotypes in horses (Equus caballus). This study used a DNA test to identify the recessive a allele on the Agouti locus, and found that none of the horses fitting the phenotype of seal brown were homozygous for the a allele. Since 2001, the mechanisms of the variations within the "bay" category remain unclear. Ongoing research suggests that Odriozola's theories may have been correct, evidenced by a parallel condition in mice. Mice have more than six alleles at the Agouti locus, including At which produces black-and-tan. It is still likely that to some extent, the "shade" of coat color may be regulated by unrelated genes for traits like "sooty", and that the phenotypes of sooty or dark bays/browns may overlap. ^ Sponenberg, Dan Phillip (2003). Equine Color Genetics 2e. Blackwell. ISBN 0-8138-0759-X. ^ "The Enigmatic Brown Horse - Color Genetics". Archived from the original on 2016-04-08. ^ Castle, W.E. ; W.R. Singleton (September 1961). "The Palomino Horse" (PDF). Genetics. 46 (9): 1143–1150. PMC 1210264. PMID 13877241. Archived (PDF) from the original on 2008-09-05. Retrieved 2008-03-04. ^ B. Kostelnik (2007). "Starting Point". The Horse Colors Site. Archived from the original on 3 March 2008. Retrieved 2008-03-04. ^ Rieder S, Taourit S, Mariat D, Langlois B, Guerin G (2001). "Mutations in the agouti (ASIP), the extension (MC1R), and the brown (TYRP1) loci and their association to coat color phenotypes in horses (Equus caballus)". doi:10.1007/s003350020017. ^ Laura Behning (2008-02-05). "The Base Colors". Morgan Colors. Archived from the original on 2008-05-17. Retrieved 2008-03-04. ^ Hustad, C.M. ; W. L. Perry; L. D. Siracusa; C. Rasberry; L. Cobb; B. M. Cattanach; R. Kovatch; N. G. Copeland; N. A. Jenkins (1 May 1995). "Molecular Genetic Characterization of Six Recessive Viable Alleles of the Mouse Agouti Locus". Mammalian Genetics Laboratory. 140 (1): 255–65. PMC 1206552. PMID 7635290. Archived from the original on 8 September 2008. Retrieved 2008-03-04. ^ Nancy Castle (2008-03-01). "Brown/Bay Dun". Dun Central Station. Archived from the original on 10 March 2008. Retrieved 2008-03-04. Look up bay in Wiktionary, the free dictionary. Wikimedia Commons has media related to Bay horses.